MAYBE IT’S a look that’ll catch on. Maybe people will like the curly eyebrow look. Or more importantly, how soon will my eyebrows grow back? Once again I’ve been burning piles of rubbish, but this time it wasn’t just old branches and brambles that were getting caught by the flames. Unfortunately, on one of the many, getting-too-close-for-comfort occasions, I was knocked back several feet by the heat but this time the flames had caught my fringe, eyebrows and eyelashes. I immediately felt my face as the smell of burning hair wafted past me. I set off bright and early on Thursday morning, off to pick up the Charollais tup who was coming to visit our ewes for a couple of months. Only a few hours later, I was on my way back up the motorway from Sheffield, with not one but two tups laid down in the back of the Land Rover to keep me company. I was offered the loan of two of them and the thinking was, with a little healthy competition between them, it may ensure that one way or another we’ll have plenty of lambs in April. When we got back to the farm I had to quickly mix up some ‘Raddle’ which I had been given, and then I needed to smear it on the tups’ chests. I was given some to try rather than using a harness and a block of chalk. By using the ‘Raddle’ or chalk, it enables us to see more readily which of our ewes have been getting romanced by the tups. It didn’t take very long at all for the ewes to get noticed, so I soon disappeared and left them to make their introductions and become better acquainted. The other night I nipped across into the barn to pick up some logs for the fire. As it was pouring down I couldn’t be bothered with putting my boots on and messing about with all that lacing them up, for just a few minutes. 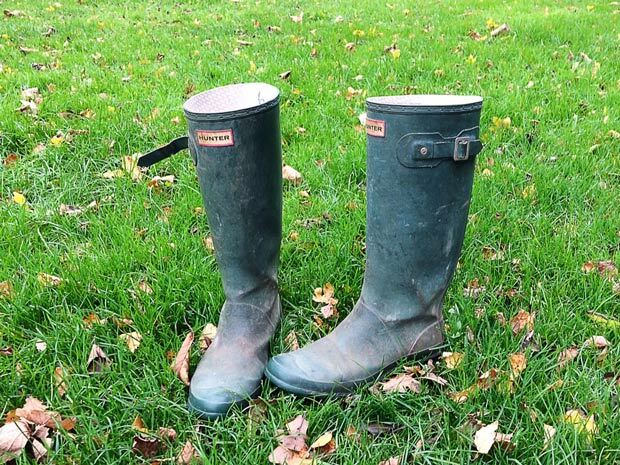 So, I grabbed Wendy’s wellies and squeezed into them, not bothered what I looked like. As I rushed into the barn I didn’t turn any of the lights on, as I was only hanging around for a moment and so thought I would just use my phone torch to get what I wanted and get out. Things so often never go to plan, when I’m involved, just why is that? I had only been in the barn for a few seconds when I heard the squeak of a mouse, well I thought it was a mouse, but it may have even been a rat. I ignored it, I didn’t have time to be checking out what animal it was, but the thing was, whatever animal it may have been, it was doing all in it’s power to make sure it got noticed. It was following me as I made my way around the barn in the dark. Every corner I turned it seemed to be there and I was just intrigued to find out just what animal it actually was. As so often happens in these situations, each time I stopped, it kept still and each time I carried on walking it seemed to move once more. Eventually, after almost 20 minutes of hunting I tracked down the culprit. In fact it wasn’t any kind of hairy rodent following me around the barn, it was Wendy’s squeaky welly! That’s what I get for snaffling her footwear.